Click here to order your copy. And please help spread the word via your blog, Twitter, or Facebook account. My second book, Learning Education: Essays & Ideas from My First Three Years of Teaching, is now available through Second Drafts for just $12.75 (+$3 for shipping). In addition, purchase my first book, TwentySomeone: Finding Yourself in a Decade of Transition, and get the best price available at just $10 (+$1 for shipping). To order online, go to the Second Drafts storefront and click the book(s) you want, add them to your cart, click checkout, and pay via PayPal (allow 7-10 days for delivery). Be sure to include your shipping address with your order (allow 7-10 days for delivery). Questions? Feel free to leave them in the comments and I'll get back as soon as I can. Here’s a sweet little preview of my forthcoming book via Blurb‘s BookShow widget. While the book will be in paperback instead of the displayed hardback, you can flip through the entire thing below and get an idea of its “plop” value. Blurb’s prices are way high for individual orders, so I’m working on a little storefront you can order through to get Learning Education at a 23% discount (from $20.55 down to $15.75, which includes shipping – I’ll even sign it for you). This will go live on Tuesday, so check back then to place your order. In the meantime, I’d really appreciate your help in spreading the word about Learning Education. As it’s obviously written with educators (particularly new educators) in mind, would you mind emailing every teacher you know and linking them here? And, since we’re coming up on graduation season, don’t forget that TwentySomeone makes a great gift for college graduates and their parents alike, so let them know (again, I’ll have a special deal on the storefront Tuesday – I’m happy to sign those as well). More as I have it. Thanks for your help. I’m celebrating a milestone of sorts today, namely the third anniversary of officially being hired as a teacher at Westminster Christian Academy. In honor of the day, as well as that Learning Education releases in less than a week, I thought I’d post the introduction to the book here. Hope you enjoy. On April 20, 2007, I was a second-year seminary student with an undergraduate degree in geography who wanted to write and teach for a living. I’d already written my first book, but the only real classroom credential I could list on a resume was teaching Bible part-time at a classical school the year before. My mother was an English teacher for 30 years, and my grandfather had been a beloved elementary school principal for 40; maybe, I thought, that would count for something. There I was – a guy in his mid-thirties with little formal classroom experience and no education degree – applying for a Bible position that over 50 others were applying for as well. Married with four daughters, I’d spent the past 12 years raising support as part of our camp and conference ministry, but since I was no longer camping and conferencing, the support was running out. I was only halfway through seminary and had failed Hebrew twice; a full-time teaching position just seemed out of the question. Gracious personal references somehow positioned me as one of the top three candidates applying for the role, but I still had to convince the administration I knew something about teaching (or at least enough to get hired and learn what I didn’t). After a shaky interview (remember my qualifications – or lack thereof), I taught an 80-minute Ethics class I’d prepared on the eighth commandment. By God’s grace, I received a round of student applause at the end of the class (a first, I was told), and a phone call later that day informing me I got the job. Now began the real education…mine. Finishing my degree while teaching full-time gave me a chance few teachers get – take important education classes toward qualifying me for what I was already doing as a real teacher. Forget eight weeks of student semi-teaching; this was a daily do-or-die, trial-by-fire, multi-year, hands-on reality…and the best (and hardest) training for “learning” education. Meant to be as much memoir as methodology, Learning Education chronicles these first three years and what it was like to go to class in the evening, learn something new, and try it out with students the very next morning (honestly, some of the best lesson plans my first year were little more than this). I wrote a lot about what I was learning as a student, and even more about what I was learning as a teacher (though I wouldn’t say the two were or are mutually exclusive by any means). While most of the material is comprised of edited blog posts and submitted seminary papers, I’ve also included interviews, emails, lists, notes from reading logs, quotes from articles and book reviews, and anything else that seemed to make summarizing sense of my experience. Read the book straight through, or pick and choose according to your interests. I won’t promise you’ll become a better student or a better teacher, but my prayer for you – as it was for me – is that you’ll become better as both. The only formal classroom credential husband, father, and author Craig Dunham could list on his resume was teaching Bible part-time at a small classical school the year before. But his mother had been an English teacher, his grandfather had been a beloved elementary school principal, and Craig knew he loved the classroom (which is why he was applying for the job) and that he wanted to teach from a Reformed Christian worldview (which is why he was going to seminary at the same time). References helped secure him a place among the final three candidates of the 50+ who had applied for the open Bible position at Westminster Christian Academy in St. Louis, but he still had to meet with administration and guest-teach a class. After a shaky interview, he taught an 80-minute Ethics class on the eighth commandment, receiving a round of student applause (a first, he was told) and a phone call later that day informing him he got the job. 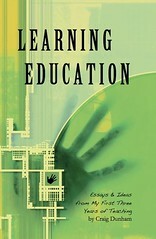 I just uploaded the file for my first self-published book called Learning Education: Essays & Ideas from My First Three Years of Teaching. The book is 5X8 and runs 120 pages in length. My proof copy is due here on April 26th, and the book should be available and ready to order on the 27th. In the meantime, I thought I'd post the cover here (be kind, as the designer's a little sensitive about his old-school Photoshop skills…ahem). In the past week, I've coached five baseball games, the last of which counts almost for two as it went 12 innings (high school games are seven innings). The good news: we won every game (even the 12-inning one); the other news: by the end of the week (or really by Wednesday) I was completely exhausted. When I got home Friday night after school, a seminary class, and a reunion dinner with my family to reintroduce myself as husband/father, I was so tired that I was in bed and asleep by 7:30…that is, until Megan came to bed at 11:30, which is when I woke up and couldn't go back to bed. I knew I was still wiped out, but I could not for the life of me fall back asleep. And now it's early morning. Nuts. Then I read about experiments in which researchers filled an aquarium with four inches of water and placed a long triangle-shaped column the length of the aquarium floor. The edge of the triangle jutted up out of the water by an inch or so, and the mice would perch themselves on the edge so as not to fall in and get wet. However, when the mice fell asleep, their grip on the edge relaxed, they fell off, woke up, and scrambled back onto the edge, newly awakened but increasingly sleep-deprived. This went on for days and weeks until they finally died from sheer exhaustion. kept Megan up at night. This sleep pattern continued when we moved to St. Louis five years ago, but it didn't make sense because we were through the crying-kids-at-night stage, yet I was still waking (and getting) up. Studying in seminary became especially difficult as I couldn't read anything even early in the evening without falling asleep 20 minutes later. Then, when I started teaching full-time in addition to everything else, I would come home from school and have to lay down for a good hour, as I was so wiped out from the day. At Megan's request, I finally did a sleep study at St. Luke's Sleep Medicine and Research Center and found out that I woke myself up approximately 100 times a night due to sleep apnea. Apparently, I have very narrow nasal passages that hinder my breathing and keep my brain from dropping into REM sleep because it's too busy making sure I don't stop breathing altogether by causing me to gasp for more air. Yet because I had been kind of asleep, I never really noticed (though Megan did, especially the gasping part). For the past couple of years now, I have been sleeping with a mask that's connected to a ventilator of sorts and pushes air through my nasal passages to keep them from collapsing during the night. The mask took some getting used to (I'm a tummy sleeper, so I've had to learn to sleep more on my side), but the change has been remarkable: I sleep harder, I rarely wake up enough to get up in the middle of the night, and best of all, the dreams are back and that really makes me happy (I have cool dreams). Except last night, when there were no dreams because there was no sleep. I was afraid this might happen going to bed so early, but I had little choice – my body just wouldn't stay up any longer. So, I'm a little tired this morning, but as this is my last clear Saturday to work on my seminary capstone project, I need to resist the urge to try to go back to bed. Thankfully, I have four alarm clocks with legs who will do the trick when they get up pretty soon, but for now, I'm glad a night like last night is the exception and not the rule anymore. his Spirit who dwells in you." It's April Fool's Day. As Mark Twain wrote in Pudd'nhead Wilson, "This is the day upon which we are reminded of what we are on the other three hundred and sixty-four." Indeed. I bought it hook, line, and sinker…and laughed at myself for doing so later. Inspired by that experience, I suppose, I played a trick on Megan's readership last year by hacking her blog with my own piece of journalistic fiction that I thought I'd link up today in case you missed it the first time around.